On Moloka`i's south shore, this oceanfront hotel is located on 4 acres of beautiful tropical landscaping, with an expansive lawn that leads to the beach and dramatic views of the Island of Lana`i and the Kaloko`eli fishpond. Unwind in spacious one- or two-bedroom ocean view and oceanfront suites. 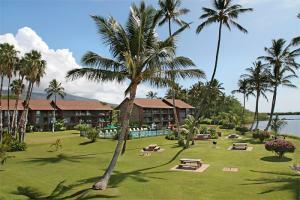 Centrally located in Moloka`i's largest town, this property offers a large pool, BBQ facilities and laundry facilities. All suites feature full kitchens, lanais, and FREE local calls. Centrally located in the town of Kaunakakai, only 12 miles from the Hoolehua Airport.